The Directory below provides a list of registered dance/movement therapists in private practice working with individuals and/or groups. Also included are practicioners’ locations, special interests and areas of expertise. Chronic Pain and geriatric issues. Therapists have a minimum of a Master’s degree or equivalent in educational training, extensive background in dance and movement studies, and at least two years clinical experience and practice. Trained in psychology as well as the developmental, expressive and communicative aspects of movement dance/movement therapists use both movement and verbal interactions to effect social, emotional, cognitive, behavioral and physical change, and/or spiritual growth. Populations: Adults, Teens, Families, Groups. Recent and Developmental Trauma, Relational Issues, Mood Disorders; Artist. Additional Information: I combine dance/movement therapy with verbal therapy as well as somatic experiencing as needed, and by mutual agreement with the people with whom I work. If what we do is seen, joined, accepted, and worked through we feel able to go beyond the familiar, to plant a foot in new territory and grow anew, using the pain of old experience for fertile new wisdom. Additional information: Has 21 years of group and mental health experience in a vast variety of settings, advanced training and certificate in Neo-Reichian Psychotherapy, received certificate in Alcohol and Substance Abuse Counseling from Long Island University, worked for over 10 years at Bellevue Hospital in Addiction Psychiatry, has taught research methods for over 6 years at Pratt Institute’s Graduate CAT Program, served on ADTA research subcommittee for 5 years and has published work in The Arts in Psychotherapy. Remains active in choreographing and performing. Offers: Provides clinical supervision for professional development and licensing requirements as well as individual psychotherapy. Offers: Individual and group supervision to R-DMT (s). Individual and group Authentic Movement. Additional Information: Specializing in attachment issues, depression, anxiety, and trauma, adjustment issues and pervasive developmental disorders. Cara serves as adjunct faculty at Pratt Institute. Offers: Individual and group therapy for adults, child and caregiver movement classes, supervision for Board Certification. Specialization: Sport/performance counseling working with athletes on the emotional and mental aspects of performance, including motivation, anxiety, injury avoidance and rehab, and retirement. Offers: Supervision and individual, couples and group therapy. Offers: Authentic movement, individual therapy, group therapy, supervision for practicing clinicians, and telepsychotherapy. Offers: Psychoanalytic supervision, dance therapy supervision and integration of both. Additional Information: In 1993 I completed Authentic Movement training with Zoe Avstrich and (In 1995) I completed the KMP Training program as well as family therapy training at the Urban Institute. I am a Licensed Psychoanalyst since 2006 and completed additional advance Relational Psychoanalytic training at the Allison White Mitchell center in 2009. I am a faculty member at the Institute for Expressive Analysis- which is a psychoanalytic training institute which specialize in the integration of creative arts and psychoanalysis in NYC. Populations: Children, adolescents and adults with development delays ; in-patient adolescents and adults with a range of psychiatric diagnoses; normal neurotic. 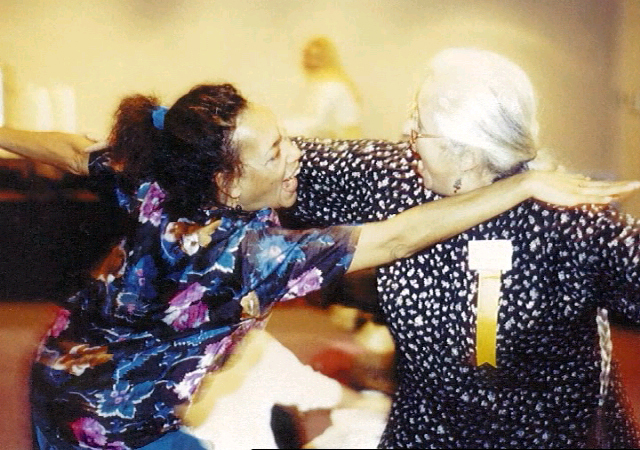 Additional information: I have worked as a dance therapy clinician and educator for four decades. In particular, my work has included providing direct treatment in in-patient and out-patient settings and supervision of practicing therapists who seek to deepen their understanding of their working relationship with clients and/or their staff. Populations: MRDD Populations, Children on the Autism Spectrum, Children with Behavioral Disabilities, Adults with Acute Psychiatric Illness, and any other mood disorders. Offers: Supervision, both individual and group. Additional information: I ground my theory and practice around Object Relations Theory. I believe in the power of change and with the right foundation growth can occur in many aspects. Additional information: I have worked as a dance/movement therapist since 1987, providing dance/movement therapy and creative arts therapies to people with many different issues. I also teach Introduction to Dance/Movement Therapy at Russell Sage College. Population: Children with autism spectrum disorders, Elderly alzheimer/dementia. Population: Multiple diagnosis, psychiatry, language barriers and physically disabled in long term care. Additional information: I have worked full time for New York City Health and Hospitals Corporation for thirty four years. Population: specializations include trauma, pre and post-natal, special injuries and rehab, DMT combined with yoga therapeutics. Offers: Supervision and new therapeutic clients on a limited basis. Additional information: Most of my work is combined with yoga therapeutics and I also specialize in teaching applied anatomy (especially workshops for movement therapists). Offers: Individual and group dance/movement psychotherapy, Clinical supervision in DMT. Additional information: As a professional dancer trained in Afro-Caribbean traditional dances, I also incorporate these elements into my theoretical framework and DMT practice. Population: I work with children, adolescents, families, couples and individual adults. Additional information: I have extensive postgraduate training in child, family and couples therapy from the Institute for the Arts in Psychotherapy and the Ackerman Institute for the Family. My work encompasses verbal psychotherapy as well as dance/movement therapy and developmental transformations (a form of play therapy for all ages), depending on the desires of the client. Population: Adults and adolescents, treating anxiety/depression, and specializing in trauma, body image problems, psychosomatic issues and relationship difficulties. Offers: Supervision to R-DMT(s) seeking the BC-DMT as well as therapy to students and therapists. Additional information: My work in private practice is based in both dance/movement therapy and somatic psychology, to address both the internal experiences of oneself as well as the expression of yourself with others. I offer a compassionate model that works by ‘listening through the body’ to discover your ‘true self’ who lies within.